The electrosurgical unit (ESU) is a workhorse for surgical procedures. It uses high-frequency electrical current for cutting and coagulating tissue. There are also specialized ESU-type devices, including those that incorporate argon beam and ultrasonic vibration technologies. 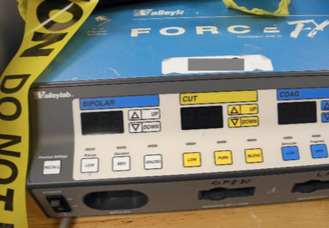 In forensic engineering cases that involve an electrosurgical unit, failure of the ESU itself is relatively rare. More common are problems with ESU accessories and with setup and use of the ESU. A problem we have seen multiple times is incomplete insertion of ESU electrodes (left). The result is that not all of the ESU current flows from the distal end (tip) of the electrode, as intended, but also from the proximal end (near its insertion point, right), potentially causing tissue burns at unintended locations. The possibility of inappropriately-located ESU current flow can become even more hazardous during laparoscopic procedures in which the surgeon has a limited field of vision and may be unable to immediately recognize the effect of inappropriate current flow. The surgeon’s response to inadequate cutting or coagulation at the intended site may lead him or her to increase the ESU power setting, which can lead to greater tissue damage at the unintended site. 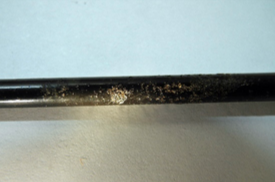 The underlying cause may be failure of electrode insulation, which may be apparent upon visual inspection (right) or detectable only by insulation testing equipment. Other ESU-related problems include burns at the return electrode site (left) that are now, fortunately, much less common due to electrically isolated (not ground- referenced) return electrodes. There can also be burn-like lesions caused by pressure or other effects on poorly-perfused tissue during lengthy procedures.